Osweiler with the Texans in 2016. Brock Alan Osweiler (born November 22, 1990) is an American football quarterback for the Houston Texans of the National Football League (NFL). He played college football at Arizona State University. He was drafted by the Denver Broncos in the second round of the 2012 NFL Draft. As a Bronco, he won Super Bowl 50 over the Carolina Panthers. Born in Coeur d'Alene, Idaho, Osweiler was raised by his parents, Kathy and John Osweiler, in Kalispell, Montana. Brock attended Flathead High School. Osweiler's older brother, Tanner, played college football in the National Association of Intercollegiate Athletics (NAIA) at Montana Tech in Butte. Their father received scholarship offers to play football at Montana and Montana State but ultimately chose to enter the military out of high school. He played both football and basketball; football was the dominant sport in Montana, so Osweiler traveled to neighboring states to play for Amateur Athletic Union (AAU) basketball teams in Portland, Oregon, and Seattle, Yakima, and Spokane, Washington. In 2006, after his freshman year of high school, he committed to Gonzaga University in Spokane to play basketball, but later decided to focus on playing college football. As a senior, he was the 2008–2009 Gatorade Player of the Year in football for Montana after he completed 189 of 303 passes for 2,703 yards and 29 touchdowns; he also rushed for 700 yards on 162 carries with 13 touchdowns. Osweiler chose to attend Arizona State University over scholarship offers from Stanford and Washington State. As a true freshman in 2009, Osweiler played in six games with one start. He became the first true freshman to start a game for the Sun Devils since Jake Plummer in 1993. He finished the season completing 24 of 55 passes for 249 yards with two touchdowns and two interceptions. As a sophomore in 2010 he again played in six games with one start. For the season he completed 62 of 109 passes for 797 yards, five touchdowns and no interceptions. As a junior in 2011, he took over as the Sun Devils starting quarterback after the retirement of Steven Threet. He finished the season with 4,036 yards and 26 touchdowns. Osweiler was rated the sixth best quarterback in the 2012 NFL Draft by NFLDraftScout.com. He measured 6' 6 and 7/8 inches tall at the 2012 NFL Combine, instead of the 6'8" that the media had touted throughout his Arizona State career. Osweiler was selected with the 57th overall pick in the second round of the 2012 NFL Draft by the Denver Broncos. He signed a rookie contract for four years and $3,516,000 through the 2015 season. Osweiler made his NFL debut in Week 4 of the 2012 NFL Season against the Oakland Raiders. The Broncos won the game 37–6. He threw his first pass in a Week 17 victory over the Kansas City Chiefs, finishing 2 of 4 for 12 yards. In a Week 4 win against the Philadelphia Eagles, Osweiler came in to complete 2 of 3 passes for 10 yards, adding the rush yards on two attempts. In a Week 17 win against the Raiders, Osweiler completed 9 of 13 attempts for 85 yards. During the Week 12 overtime loss in the 2013 season, Osweiler was put into the line in an attempt to block the New England Patriots game-winning field-goal, as he is the tallest member of the team at 6'7" (2.01 m). In a Week 7 42–17 win against the San Francisco 49ers Osweiler attempted one incomplete pass. During a Week 10 41–17 win against the Raiders, Osweiler completed two of five passes for 13 yards. During the Broncos Week 15 22–10 win against the Chargers, Osweiler had two incomplete passes. Osweiler threw his first career touchdown against the Oakland Raiders on December 28, 2014. Against Kansas City on November 15, 2015, Osweiler took over for Peyton Manning, who was benched after throwing four interceptions and posting a passer rating of 0.0. The Broncos later announced that Osweiler would start in place of the injured Manning the following week against the Chicago Bears. In his first start on his 25th birthday, he completed 20 out of his 27 passes for 250 yards with two touchdowns and a 127.1 passer rating in a 17–15 win over the Bears, becoming the first player to start and win his first career game on his birthday. He was named the AFC Offensive Player of the Week for his performance against the Bears. Osweiler was presented the game ball after the game by head coach Gary Kubiak. The next day, it was announced that Osweiler would start the following week against the New England Patriots. On November 29, 2015, Osweiler led the Broncos to a win over the then-undefeated Patriots in overtime, 30–24. He completed 23 of 42 passes for 270 yards, one touchdown, and one interception. Osweiler started his third consecutive game for the injured Manning during Week 13 against the San Diego Chargers. He finished the game with 16 of 26 completions (61.5%) for 166 passing yards, 1 touchdown, and 1 interception. The 17–3 victory marked the third consecutive win for Osweiler. The following week, Osweiler earned his first loss during a 12-15 loss to the Raiders. He capped the game off with a career-high 51 attempts, completing 35 of them for 308 yards. On December 15, it was announced that Osweiler would start his fifth consecutive game, against the Pittsburgh Steelers, even though Manning had returned to practice. During the game Osweiler completed 21 of 44 passes (47.7%) for 296 yards and three touchdowns and one interception. He also carried the ball 5 times for 19 yards and a seven-yard touchdown, but Denver ultimately lost 34–27. In Week 16 Osweiler started sixth consecutive game against the Cincinnati Bengals, completing 27 of 39 attempts (69.2) for 299 yards and one touchdown in a 20–17 overtime win. In the Broncos' regular-season finale, on Jan. 3, Osweiler was replaced by Manning in the third quarter after throwing two interceptions and fumbling once. Manning led the Broncos to a 27–20 win over the San Diego Chargers and helped the Broncos secure the top seed in the AFC. On January 7, 2016, the team announced Osweiler suffered a low-grade strain to the medial collateral ligament of his right knee during a game against the San Diego Chargers. Osweiler finished the season completing 170 completions out of 275 attempts (61.8%) for 1,967 yards for 10 touchdowns and 6 interceptions while having a 86.4 quarterback rating. Osweiler also rushed for 61 yards on 21 attempts for one additional touchdown. Even though Osweiler had been benched for the 2015–2016 playoffs, he won a Super Bowl ring with the Broncos after they defeated the Carolina Panthers 24–10 in Super Bowl 50. On March 9, 2016, Osweiler signed a four-year, $72 million contract with the Houston Texans. Making his first start for the Texans on September 11, 2016, Osweiler had 231 passing yards with 2 touchdowns and an interception in the 23-14 victory over the Chicago Bears. ↑ "Brock Osweiler Biography". Arizona State Athletics. Retrieved September 15, 2015. 1 2 3 Fetters, Chris (February 18, 2008). "Osweiler to make a big decision". Scout.com. Retrieved September 15, 2015. (subscription required (help)). ↑ Reece, Myers (November 12, 2009). 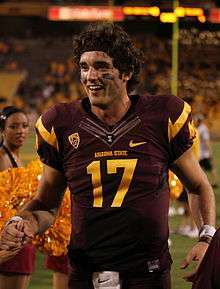 "Osweiler to Start for ASU Saturday Against Oregon". Flathead Beacon. Retrieved 2015-12-13. ↑ Feldman, Bruce (February 23, 2011). "ASU's Steven Threet calls it a career". ESPN.com. Associated Press. Retrieved 2015-12-13. ↑ "Brock Osweiler". nfldraftscout.com. Retrieved August 29, 2016. ↑ Bien, Louis (April 28, 2015). "What do we really know about the Broncos' backup quarterback?". SB Nation. Retrieved 2015-12-13. ↑ Kirk, Jason (February 24, 2012). "Brock Osweilier Is Not That Tall, Nothing Is Real Anymore". SB Nation. Retrieved 2015-12-14. ↑ "2012 NFL Draft". NFL.com. Retrieved May 22, 2015. ↑ "Brock Osweiler - Quarterback". rotoworld.com. Retrieved May 22, 2015. ↑ "Brock Osweiler". ESPN.com. Retrieved 2016-02-08. ↑ Legwold, Jeff (November 27, 2015). "Broncos QB Brock Osweiler can expect the unexpected against Patriots". ESPN. Retrieved November 29, 2015. ↑ Legwold, Jeff (November 16, 2015). "Broncos to start Brock Osweiler ahead of injured Peyton Manning". ESPN. Retrieved November 17, 2015. ↑ Ortega, Mark E. (November 25, 2015). "Brock Osweiler tops Week 11 Players of the Week". nfl.com. Retrieved March 8, 2016. ↑ "NFL.com Player Profile:Brock Osweiler". Retrieved December 16, 2015. ↑ "Osweiler has MCL strain in right knee". 9News. Retrieved 2016-01-08. ↑ Ganguli, Tania (March 11, 2016). "Brock Osweiler says he's excited to play in Texans' offense". ESPN.com. Retrieved March 11, 2016. ↑ Barshop, Sarah. "Brock Osweiler, retooled Texans offense shine in win over Bears". ESPN. Retrieved September 12, 2016. ↑ "Brock Osweiler Stats | Pro-Football-Reference.com". Pro-Football-Reference.com. Retrieved 2016-10-25. Wikimedia Commons has media related to Brock Osweiler.